In Shaivism, Shiv ji is Mahadev, the Supreme God. He is Sada Shiv, ever-present, pure consciousness, the beginning and end of all things. He is the personification of great peace and great terror in different forms. I had been doing sketches of Shiva or Shiv ji as I like to call him, in my trip to India back in 2012. Having visited sacred places, spoken to devotees and meditated, I was in that zone where I was peaceful and sketching effortlessly for hours a day. The pencil just flowed even in the heat of July. After summer, I came back to Canadian Winters, with a sketchbook filled with artworks of Shiv ji, Vishnu ji and Hanuman ji. I simply put my book aside and got back to my old paintings, my old routine but in the back of my mind, there was this itch to paint some of these Sacred Forms. However strong that itch, I still carried on the old routine. Then after I saw “Devon Ke Dev Mahadev” that feeling of wanting to paint Shiv ji manifested. I felt inspired to learn about and to paint Shiv ji. I began reading articles on him and began to get a feel for his persona. I began to meditate and access that deep peaceful pool at the center of my being. And I began to paint Shiv ji. 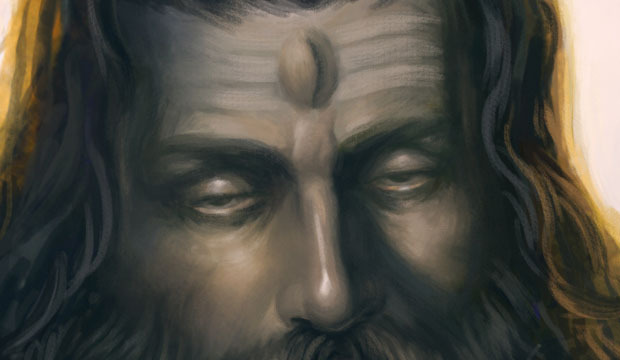 I have painted Shiva as the Adi Yogi, and he is bearded just like his bhakts, devotees, the yogis who meditate on him. He looks out to the viewer with his eyes half closed, in a calm-meditative state, to remind them to pray for such peace. With his throat, he traps the vish, poison of the world, and with his hand, he blesses the viewer with amrit, heavenly tranquility. 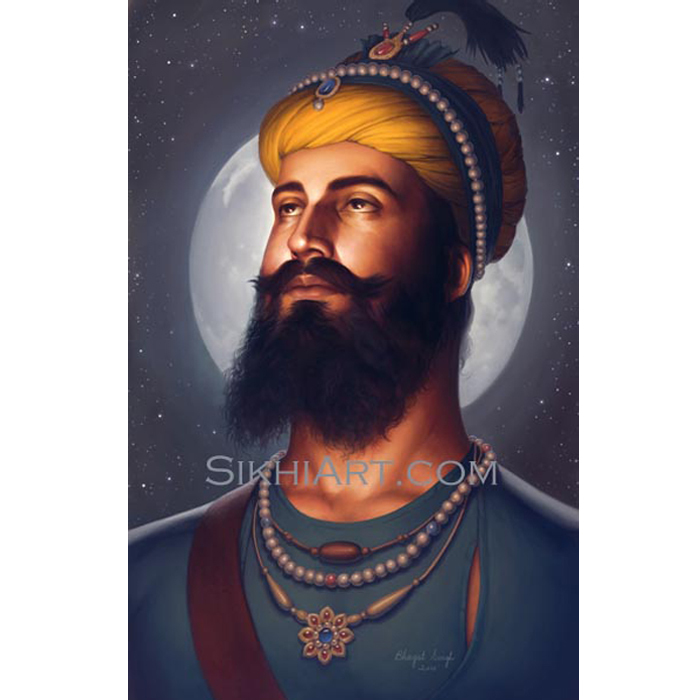 In this painting, he is dressed in tiger skin, rudraksh mala (rosary) and ardh chand (crescent moon). From his matter locks, trickles a small stream of the holy Ganges, Ganga river, and a cobra rests peacefully on his neck. That said Shiv ji is formless, he is not limited to any characteristics, forms and features. He transcends them all. 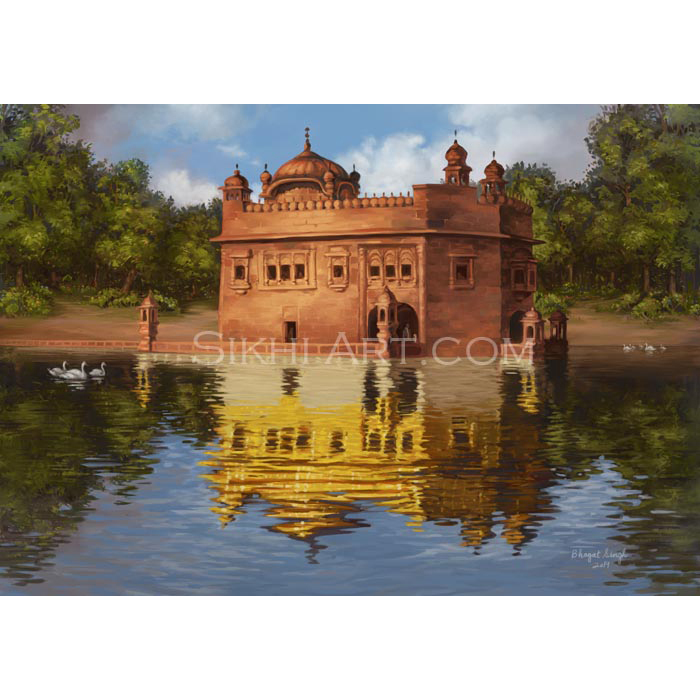 Order some prints of Shiv ji for your cozy home or as great gifts to loved ones! I like them. I promote all good things. Actually according to Vedic literature Shiva ji was “jatta joot” and had both a beard and u shorn hairs. Rishis also never cut their hairs. Shiva Ji punished a wrong doer once by having that person’s beard shaven, to have shaved beard is considered shameful. Sadly Hinduism and some corrupted Brahmins have changed shiva jis image in popular media in India to better suit their own image or program. When historically Shiva kept hair and beard like a Sikh. Hi Preet. I have a question for you. If for next 2 years you went to jungle and went in deep shiv meditation. After 2 years you come back to your house and see yourself in a mirror.. WHAT WOULD YOU SEE? wouldn’t you see a beautiful beard and long hair? This is being to be in a natural state of life. Just like all our Gurus.. Either Hindu or Sikh and any other person in this world. Bro, on the name of Sikhism you are being praised of your art ..please try not yo defame such a pure and amazing way of humanity. Its a humble request. Sikhism is completely against supetstitions and has nothing to do with hindu Gods or Goddess. The name of page is sikhi art, but it is a complete violation. If you want to debate or want a clarification you must contact any intellectual from sikhism. We do not speak against any religion but our 10th Guru has delivered us straight message in Chaupai Sahib and lets not bring hinduism into Sikhi. I never imagined in a million years that I would ever paint Shiv ji or Narsingh ji or Ganesh ji. 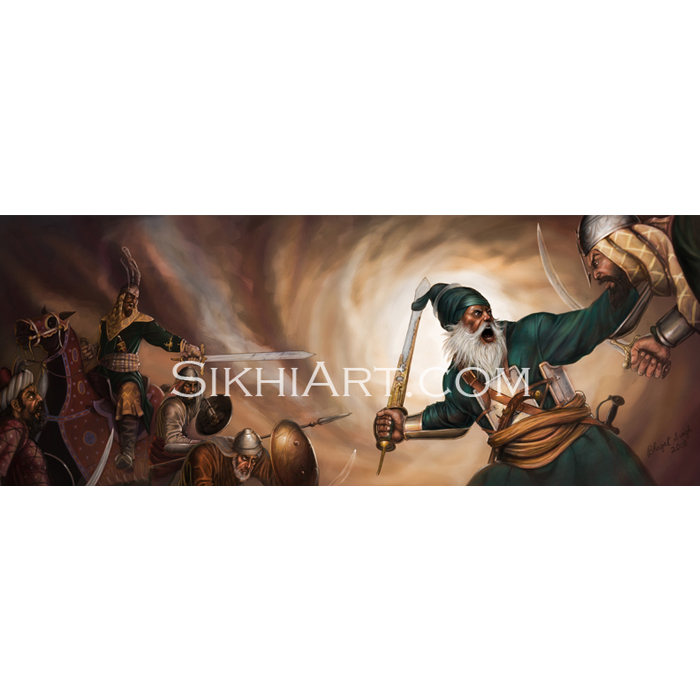 My original intent was to only do paintings of Sikh Gurus and martyrs, and the extraordinary historical events in Sikh history. I was fixed on this purpose for several years. However Waheguru had something else in store for me. In meditation, he strongly pushed me to learn deeper meanings in ancient stories of the Gods and Goddesses. He even explained some of these meanings to me directly. He said people had forgotten these meanings, and told me to paint it so that his stories and their meanings become rejuvenated and become more accessible to the people of our time. Who came into your dreams? And who said what to you? Waheguru did and it was while I was awake. I’ll tell you. Over many meditations, that one who is the master of my mind and senses, told me to make paintings of his names. In one meditation, he told me what he was called in different religions by different groups of people. For example, in India, he was called as Shiv, Vishnu, etc. Thousands of years ago, those saints who called him Brahma and Indra have passed away. In Greece, he was known as Zeus, the Romans called him Janus. They have all passed away. The naming trends always change, today he maybe called Waheguru by some people, tomorrow it will be something else like Present Moment. Everything will change, he is eternal. I was curious so then during another meditation, he explained to me how he came to be known by those names. He explained how those names connect to his essential nature. They are describing him. I was even more curious so then he explained how all these stories, all these images, and all these religions were formed. Anyways, those were some interesting meditations… He explained a lot of stuff. Maybe I will talk about it in more depth in the future but basically, he got me to paint those things which he described to me. No comments. Can you read about brain on biology book in detail please? Also psychology and neuroscience? Sikhism always asks us to believe in science hard proofs and observations. May waheguru bless you truly. I studied Biology and Psychology (including Neuroscience) at university for several years so I am well versed in those subjects and about brains. I am also well aware of what Guru Granth Sahib teaches as I study it to make paintings of our Gurus. What I shared is my personal experience and it is significant to me and my journey. Lastly, thank you for your blessings. May Waheguru be with everyone. what you fail to understand harry is that Shiva, or Krishna or Sri Ram Chander were Sikhs of thier own specific yug. 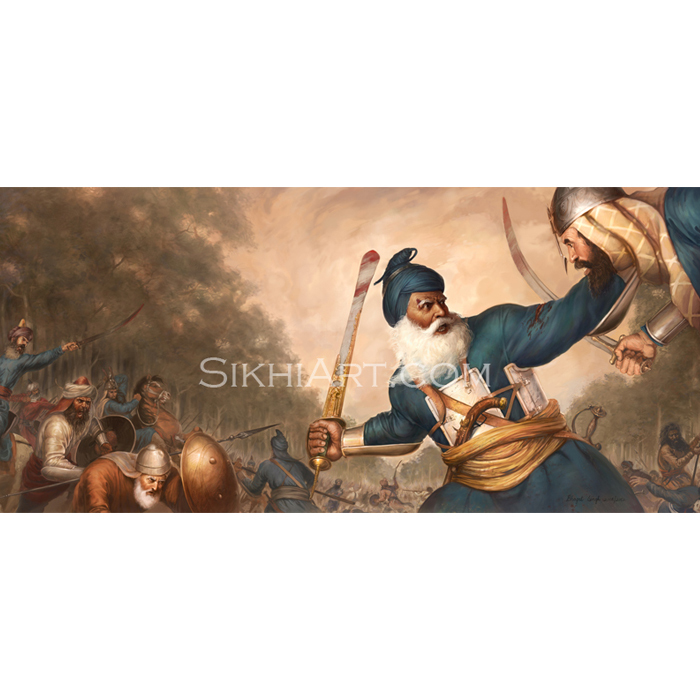 In kalgidhar Chamatkar written by Kavi Santokh Singh, there is a dialogue between the Panj Pyare and Guru Gobind Singh, and one of the Pyare says to Guru Ji before the battle of Bhangani: “you yourself were Sri Krishna when you helped the Pandavs in war against the Kauravs, and it was you who slayed Ravan as Ram Chander; what is your opinion of the upcoming battle? Will we be victorious?” This is a direct quote from Kalgidhar Chamatkar written by Brahm Gyani Kavi Santokh Singh. Shiv ji (Siva) is called Mahadev, the Supreme God, for a reason. It’s not a western interpretation to call him God. These are very ancient belief systems and religions – the Shaiv Religions. In Shaiv Philosophy, Shiv ji is peace, the most subtlest essence, and the ruler of all things. The painting of Shiv ji is the personification of God. It is a representation of the Divine. 92. Let us give reverence with oblations to that blissful God, who is the Lord of the Devas, who rules the bipeds and the quadrupeds, and in whom all the worlds rest. 93. He who realises Him, who is subtler than the subtlest, who creates the world in the midst of chaos, who assumes many forms, who is the only one that envelopes the world, the blissful one (Siva), attains infinite peace. 95. He who knows Siva, the blissful one, who is hidden in all beings in an extremely subtle form, finer than the essence of ghee, who alone envelops the universe, is freed from all fetters. 96. That God, the creator of the universe, the supreme soul, always dwells in the heart of all beings, being limited by the heart, intellect and mind. Those who know this become immortal. 97. When ignorance has disappeared, when there is neither day nor night, neither existence nor non-existence, then there is only Siva, the all-blessed one, who is imperishable, the adorable light of [the sun]. From Him the ancient wisdom has proceeded. 99. His form cannot be seen. No one perceives Him with the eye. Those who know Him through intuition, thus abiding in the heart, become immortal. Yes the lines you are stating from the Purana are equating Shiva of Kailash with the Nirankar form, or Akal purakh Narayana. That entity is only singular and the source of all creation. This one entity existed before Shiv Dev, brahma, and Vishnu, and is why is also called Sada Shiv, that form which has always existed even before shiv came into being. Shiva of kailash is the worlds very first Brahm gyan avasta purakh. He is the avtar of shiv formed by Nirankar also known as sada shiv. His name is synonymous with Akal Purakh because he became with that sada shiv entity through bhagti on kailash mountain. In chaupai guru gobind singh says that there is no difference between the devotee and akal once the devotee connects to akal. The gurmantar shiva used to connect to akal was Har Har. He is the first brham gyani of the planet, and went from a simple incarnation of a dev to mahadev. This is why Sikh gurus our utmost importance on nam jaap simran, it turns you from purash manukh into mahadev as well. You become his room as well, room of akal roop of shiva. Shiva is also founder of the jatt race, through veerbhadra who was the first jatt. That is true. The devotee becomes that which he worships. hari jan aisa chahiye jaisa hari hi hoye. I suppose you can look at it that way regarding Shiv ji. But I have never come across any Puranic source which mentions that there was ever a person known as Shiv ji. For example, we know there was a person known as Krishan ji, who gave spiritual knowledge to Arjuna in the battlefield, as recorded in Bhagwad Gita, the songs of God. In Vaishnav religions, Krishan ji is revered as the incarnation of Supreme God Vishnu. He is worshipped as Supreme God (see Bhagwad Puran, which talks about this), but also has been recognized to have come to Earth in a human body. The same goes for Ram Chandra ji as well (See Valmiki Ramayan, which talks about this). I haven’t seen any such mention of Shiv ji. He appears to me to be a personification, a representation of something abstract using the metaphor of a person. His image representation seems to have spiritual meanings – the third eye, the crescent moon, the trishul, dumroo, snakes, ashes, blue-throat, Ganga etc. Like Vishnu’s Chaturbhuj swaroop, four-armed form, this suggests that this is not an image of any particular person rather it is something abstract. People don’t have four-arms, blue skin and don’t rest on an infinite-headed serpent. So this is representing something abstract. Each element of this image is a symbol of the all-pervading God. People don’t have three-eyes, a moon on their forehead, and rivers flowing from their top-knot. So this is representing something abstract. Each element of this image is a symbol of the all-pervading God. And we can discuss what these individual symbols means. A Sikh should be a True Sikh, a Hindu should be a True Hindu and a Muslim should be a True Muslim. One should follow his religion faithfully and not step his foot over any other religion and tradition.Though basic principals of all religions are same. But on the other hand, True Art, True Music, True Emotions have no particular sect or religion. Its the reflection of inner voice. So, draw and create whatever you want. In Guru Granth Sahib, Shiva’s form is not given any importance. This is because Shiva’s religion is a separate religion. Shiv bhakts associate Shiva’s image with the supreme god. Shiv ji is commonly referred to as Mahadev. He is formless, parm atma. Also referred to as Mahakal, that which is the end of all. We often confuse humantarian cause with religion…. Read what I wrote again. I clarified that Shiv ji’s form is not given any importance in Guru Granth Sahib. The first two words of my post are – “In Shaivism, …” meaning that in Shaivism, the supreme god is seen in the image of Shiv ji. The painting is separated into its own section “Other Faiths”. IMO there should be no confusion to begin with. Sikhism teaches you to respect all religions. And if you pay attention at the Gurdwara it is quite clear that we respect the Hindu devtas also as did our Gurus- they were never dismissive. If you visit manikaran sahiba within the Gurdwara there is a writing in respect of Narayan and there are mandirs surrounding the gurdwara. Exactly. and puratan paintings by sikhs during sikh raj in punjab,1800s, show sikh gurus seated alongside other religious icons belonging to various religions. Is a big question mark on Sikh belief? What are you talking about. Its not right bro. Respect does not mean to mood the truth. Who ever said that gurbani respect devte…. By the same token gurbani respects every human being. Gurbani quote: pande tumra mahadeo daule balad charia awat dekhia tha.,,,,.. Please read the whole shabad from gurbani and you will know the truth by yourself. And there are hundreds more shabad like this. And about moorties: ekke pathar keeje bhao…duje pathar dharie pau. Dear brother whoever read and understand gurbani would not say say that. I urge you to read gurbani with meanings. Actually Shiva, Ram Chander, and Krishna Bhagwan were Sikhs of their own time, they are our direct ancestors. The Hinduism is not Krishna or Shiva in Guru Granth Sahib, Guru Ji says: “Hindu ana, Turku kana, Giani dohe siana.” The term Hindu was coined by invading Mughals to differentiate muslim vs non-muslim. The Vedas never mention a “hindu” religion, and Shiva never called himself a “hindu” either. He is a Sikh of the Sat Yug Era, as Guru Amar Das Ji says in Bani every yug has its own leaders and dharam form, in Kal Yug it is the Khalsa, in sat yug it was Shiva and Vishnu, in Treta it was Ram Chander, in Dwapr it was Krishna Bhagwan, so therefore Sikhi is one and the same thing with these dharamic figures as well. Moreover the Bedi and Sodhi Clan emerged from Ram Chander’s 2 sons Laav and Kush, who also founded the cities of Lahore and Kasur in present day Pakistan. Acocrding to Guru Granth Sahib Hindu means blind, or unknowledgable, those who attribute Shiva, etc to HInduism are themselves Hindus since they don’t have the knowledge of history pertaining to these dharmic figures of their own time. Hindu also means not to be have a Guru, and nigura (one without Guru is the worst of all), Shiva, Ram Chander, Krishna all had Gurus to show them the way, therefore they can not be hindu and must be Sikh, which also student or learner from the Sat Guru: Akal Purakh and Guru Granth Sahib Maharaj. Gill Saab, this is the the most sensible description I’ve read in a long long time. This is exactly my belief too – just that I believe gods were rockstars of their day and age, obviously not literally speaking, but from a fame point of view. God bless u and hope more people get enlightened. Hanji Veer Ji, “Jug Jug Bhagat Upaya Ram Rakhda aya Ram Raje.” Every Yug has its own Sat Gurus and Bhagats, from Sat, Treta, Dwapr, and Kal Yug. the Waheguru Gurmantr is a combination of all 4 Yug’s Gurmantar: Wa=Vaho from Vasudev Vishnu of Sat Yug, He=Hari from Sat Guru Krishna of Dwpar yug; Gu=Gopal from Guru nanak Sat Guru of Kal Yug; Ru=Ram from Sat Guru Ram Chander in Treta Yug. All of these mantars are put together to form WaHeGuRu Gurmantar of Kal Yug. This can be found in Bhai Gurdas Ji’s Varan. Sir I Totally Respect what say about the sanatan Dharma and Sikhism I believe that Hindus and sikhs are Branches of a Same tree just the procedures of worshiping God are different..Ii am a Brahmin and a Bhakta of Lord Shiva and I am very much Influenced by The Khalsa Panth I often visit the Gurudwara I find it so peaceful there that its hard to leave the place..
i grew up in a family that is completely brainwashed by the SGPC parchariks (preists). They believe Hindusim and Sikhism to be separate, they dont believe in Shiva, or Krishna, or Ram Chander. They dont care about Hanuman, Arjun, or Kali Ma. But this was the design of the SGPC, they were setup by the British as a puppet government to destroy the unity of our people. And they were very successful, too successful. Those in our race who were hungry for riches and money sided with the British to spread this propaganda. They say “No Devi Pooja,” but they dont understand what Devi really is. After I did my own research of the Dharam Granths, my own reading Guru Granth Sahib, Dasam Granth, and others, and realized that most of what I was told by so called “preists” was a lie. If a lie is repeated so many times it becomes truth, and these lies have become truth for Sikhs today. These lies were propagated to 1. destroy unity of Hindustan, 2. thereby decreasing resistance to the hold of the British Raj, 3. it helped the SGPC create a dedicated population that would only go their controlled isntitutes (SGPC controlled Gurdwaras) where they would give money: 10 rupees, 100 rupees, 500 rupees, etc. They are told this is where Sikhism is in this Gurdwara, in these walls, they do not understand the True roop of Guru Granth Sahib, they have been brainwashed to think that Guru Granth Sahib is confined at the Gurdwara that they control and is confined to the form of a Granth only. They do not understand the Nirankar form, the Nirgun form, the true form that is inside them. The true Gurdwara is inside ourselves, the outer material one is suppose to represent the true one inside. Shiva found this true Gurdwara, so did Krishna, so did Ram Chander, so did Hanuman, so did Kali Ma, They are all the same nirgun roop (Akal, Ishwar, ParBrahma) with various sargun saroops. What a brilliant response Mr. Gill. Worshipping idols is a sin. Depictions are not a sin at all. They simply tell us stories and allow us to appreciate our history. For centuries there have been depictions. We are not a harsh religion. 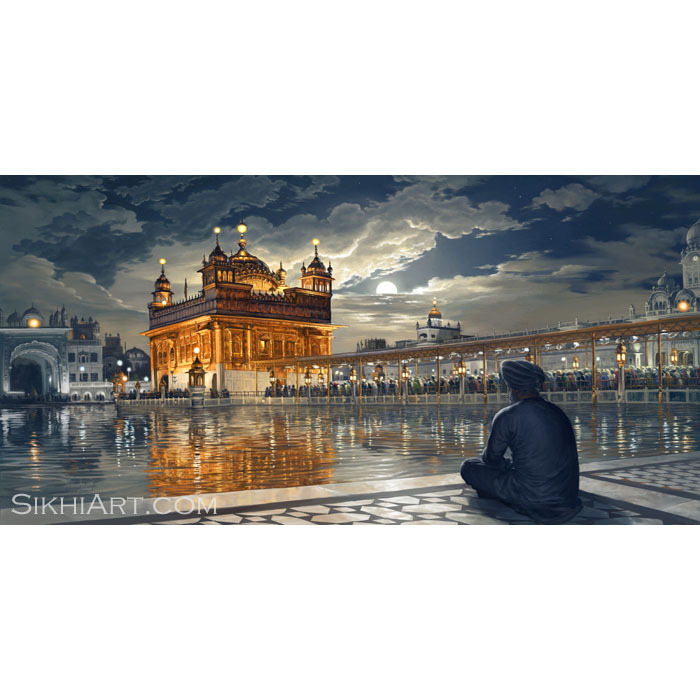 Sikhism is an all encompassing and welcoming religion that does not dictate to anyone. The depictions are not offensive but truly encapturing. Daljit, worshiping of idols being a sin could be your preception. We should respect others feelings too. Help me understand why there are pictures of our Gurus everywhere in our homes, why there are shops selling those every where and people are buying too, how is that different than worshiping an idol. Its not a sin veere, its just a way how you want to feel that energy in you. Idol means murat in our language. Khalsa is also a worshipper of an idol. 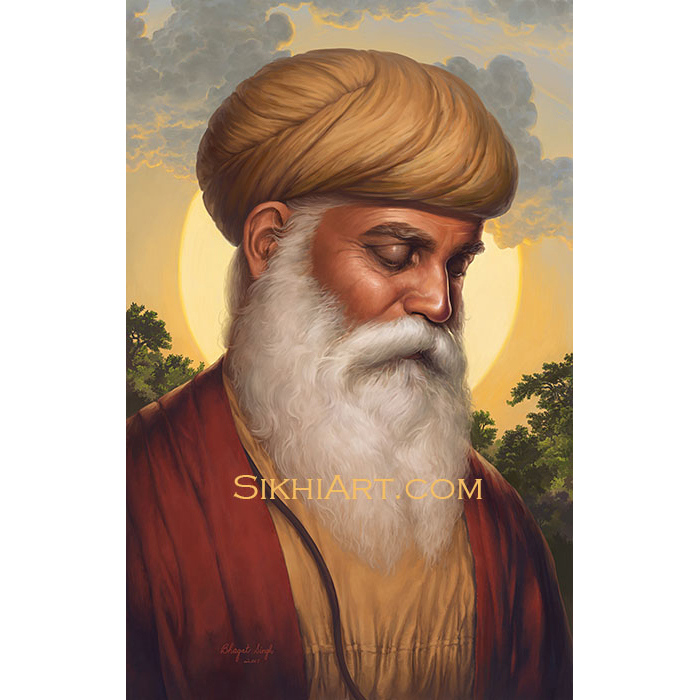 Read the mool mantar: Ik Onkar, Sat Nam, Karta Purakh, Nirbhau, Nirvair, Akal MURAT, ajooni saibnn, Gur Prasad, Jap, Aad Sach, Jugad Sach, Hai Bhi Sach, Nanak hosi bi Sach. 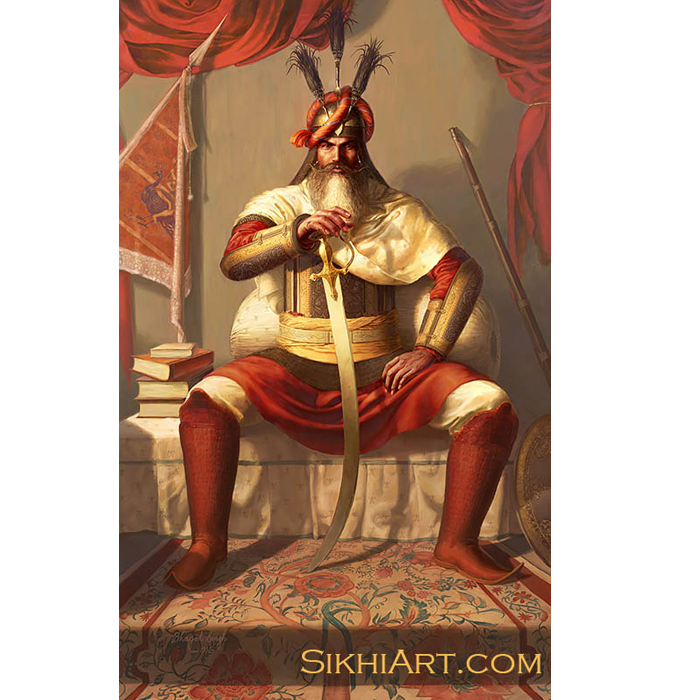 This is the murat that Khalsa and the Bhagats of the past worshipped. This moorat described in Mool Mantar, the Akal Moorat. There are 2 types of moorats, the Kal Moorat, Kal means perishable and limted by time and space, Akal means outside of time, outside of past, present, and future (hence “Aad sach, Jugad Sach, Hai bhi Sach, Nanak hosi Bhi Sach.”), this moorat is poojan yog. The pictures of our Gurus, the idols of past Bhagats, or statues of past Bhagats, etc etc. Are to remind us of the Akal Moorat that they represent. 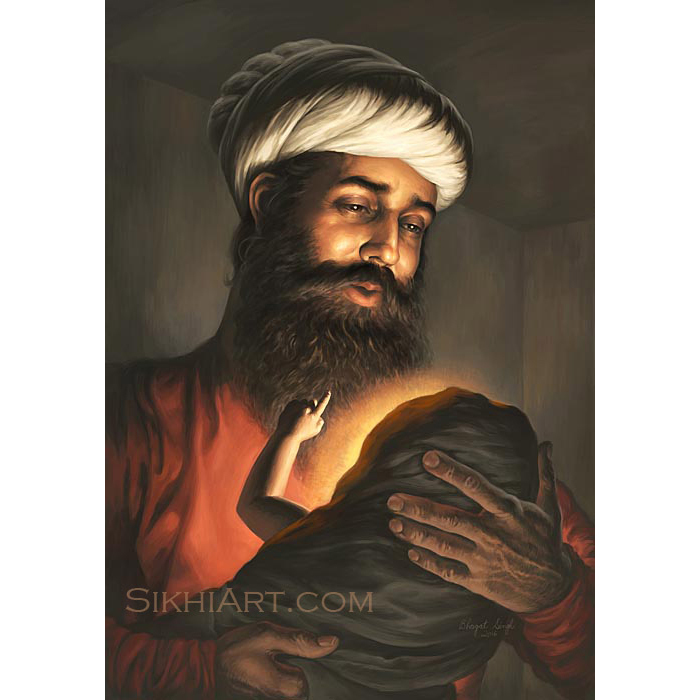 The goal of Sikhi and Bhagti in whatever Yug is to connect to the Akal Moorat, many Bhagats using stone idols and seeing the Akal moorat in them have realized God through these idols as well, because they understood that the kal moorat represented the Akal moorat inside them, ie God. Dhanna Jatt of Rajasthan found Akal in a stone, Bhagat Nam Dev used to feed milk to his stone idol and it would drink it, because to him the idol was a representation of Akal, and he had the inside bhagti of Akal Simran (Nam Bhagti) as well. There is no idol, there is only Akal, if you get stuck in the physical idol itself, and don’t search for Akal within it, then you will not make the inner journey in yourself as well. It is Akal di and Bhagat di sharda where God shows himself, in an idol, in a dream, in person, etc. Sach: Sikhism is great as it teaches us tolerance, respect and appreciation of all views no matter the religion. You are critical of my views, which is fair. However, your tone and lack of respect is unwarranted. Before preaching to others I would suggest that you take note of our Guru’s teachings with regards to mutual respect. Also, are you saying that there is a Dera within Manikaran Sahib- I do not think so. All religions are full of historic event which cannot be discounted as fallacy. Sikhism is rich in history and interlinked with the Devtas and Devis who are appreciated in our own readings of the gurbani. Problem with dumb people like me is that we don’t have language skills , softness coz we are not trained that way…. We follow only one path that may be treacherous or HARSH…….. So you keep your enlightnment to yourself and keep selling the merchandise …. The theortical way! I will bang my doors and would take the help of my angels ( 1 is creation of God and other created by man) as and when situation arises. Awesome work Sir Bhagat Singh Bedi. So much hate of other religions by Sikh’s these days. Time and time again I hear all the time. Muslims are this and Hindus are that. I thought we were all one and God is one. To each their own. Keep up the good work. Art is art. Wonderful work brother. I respect your thought and work. Shiva’s blessing hand in this sketch reminds me of Guru Nanak ji’s blessing hand. I am glad you liked it Parmy. Before the sikh religion. Sikhs were hindu. I still say they are hindu. Its understandable that guru nanak adopted out of the religion but his parents were still hindu. Its like me converting from a hindu to a chirstian and denying the fact I was once a hindu. With another simple example I can also say I want to adopt out of being a hindu and creating my own religion which is why Sikhs have only been Sikhs for 500 years but before that they were Hindus. Another thing is people divide people but don’t see it themselves. I respect Sikhs but then again I respect all religions but you are born what you are. Why change it yourself. Very nice art work & imagination.. !! I read all comments above somewhere i feel proud and somewhere shocked .. ! I am a Shivapanthi (Shiva Bhakta). Dear Sikh brothers/sisters, I am really proud & feel immense greatness to be part of society where we have Sikhism as most memorable & respectful religion. I have read so many articles & religious history of Sikhism , I conclude that this religion is devoted to help, save & honor other religion faiths… I salute your incredible sacrifices & contribution for building INDIA as most tolerant country today !!!! I wish I will be born as Sikh in my next birth… wahe guru ki jay ho!!! sat shri akaal ! I request all readers, Please do not fight/argue over Hinduism/Islam with Sikhism as All our Sikh Gurus has not laid down their life & efforts to have such believes & fights among us..
You think you know everything, Mahadev has a beard my friend, better improve your knowledge ASAP. Bhagaht bedi.im personally taking time to write this to you. the art work u did for shiva is absolutely marvellous and i personally (im a hindu) liked his state of shiva as hes is high on bhang (It is believed that since Lord Shiva is always in deep meditation, Bhang helps Him to stay in a state of complete bliss and concentrate. This is the reason why the sadhus and monks consume Bhang and smoke marijuana so that they can reach a blissful state and be like Shiva) and im proud of your work buddy,just watched this one image of shiva and i was connected and trust me please dont mind people typing anything.stay true to your heart and bring the out come heart.god always is there with us and he never judges anyone.and lastly my humble greetings to all sikhs brothers and sisters. Thank you for knowledge and respect for speaking candidly ..
As you have said : “In Shaivism, Shiv ji is Mahadev, the Supreme God”. Undoubtedly, people call Shiv by many names and one of the name is Mahadev(can be translated as Supreme god but with small g). But in YOGIC Culture, Shiv is termed as Adi Yogi(means the Adi, the First yogi), he is considered as the First Yogi , the one who discovered the ways of Yoga and Dhayan, and then distributed that knowledge to his disciples(first Seven disciples are known as Saptrishi) on the bank of the lake Kanti sarovar , which is few miles away from Kedarnath. Sir, as you are an artist, I want you to imaginate this scene when Shiv is transferring the knowledge to his disciples on the bank of lake 15,000 years ago, with snow peaks all around and may be frozen lake. Also, please try to make few things correct, as Shiv is adiyogi, his back(Spinal chord) and neck should always be straight, his eyes should be half open, but the eye balls should be in the middle of the eyes and his chest should be in manner that he has stopped the breath after inhaling. Kindly let me know if you ever tried such work. 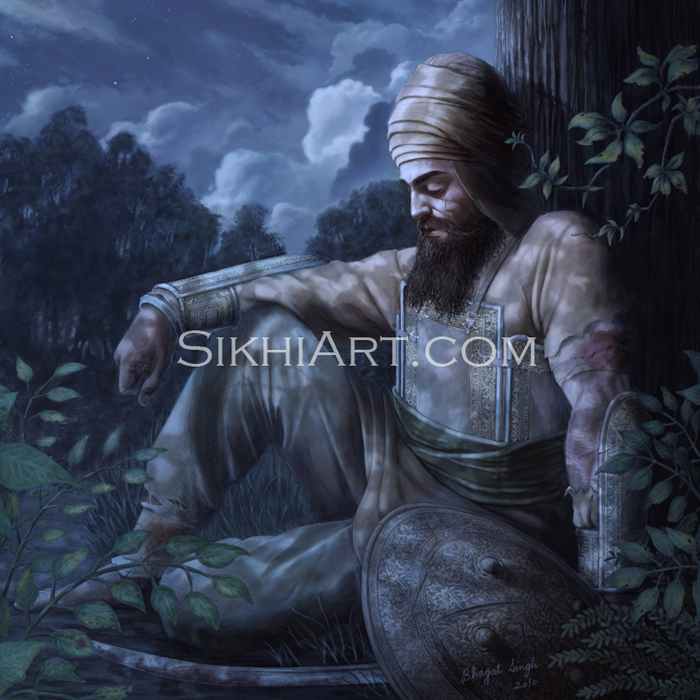 Thakur tum sarani aaya…wrote ny guru arjan dev ji.. who is Thakur? Hey Govind..Hey Gopal..Hey daya nidhan…Wrote ny Guru Nanak Dev Ji…Who is Govind and Who is Gopal..
Don’t forget your roots…as you said sikhiksam is nothing to do with hindu Gods..